Welcome to Sakyadhita in Sri Lanka! We came into being a strong voice in this country after the historic Sakyadhita International Conference on Buddhist Women in Colombo in the year 1993. Our vision is to produce an educated body of Buddhist nuns with a good knowledge of the Dhamma and Vinaya, meditation practices, temple management skill, computer knowledge, humanitarian services to the community and a research unit with well equipped library. Buddhist nuns, who in the past were confined to religious work on their own nunneries, are now playing a more effective role as social workers and change agents in society due to the training and education given to them. In the Center, social services such as Family counseling, pregnant women counseling, weekly meditation for adults as well as children, counseling for girls from correction schools, Children Dhamma programs and classes, delivering Dhamma discourses at events organized by schools and communities, conducting full day religious programmes for the general public, and many others are provided by the nuns of the Center. The Center also rises to the occasion in times of natural disasters. The nuns did flood relief work in 2003 and during the Tsunami disaster in 2005-2006 and more recently provide disaster relief to the people who suffered from landslides in the central mountain area. 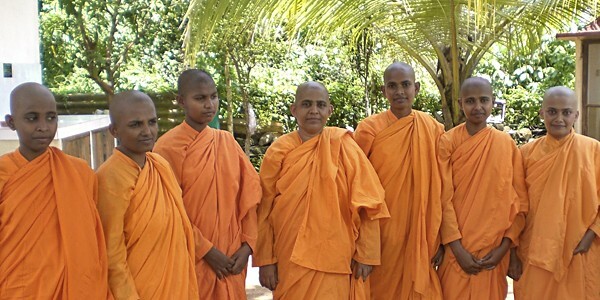 The Bhikkhuni Order was re-established in Sri Lanka about 10 years ago after a break of 1000 years. It is flourishing and spreading fast, but the Order needs to be strengthened with training and higher education and space in which its activities can take place. Your kind support will be greatly appreciated.